There is a rising dilemma experienced by many mothers during the postpartum, including years after birth, which is rarely discussed within the childbirth communities, academic journals, or amongst birth professionals. Sure, it may be referenced a few times here and there, and yes, there is public acknowledgement of the terms ‘disempowered childbirth’ or ‘traumatic birth’, but what are the consequences of such occurrences? The predicament I am referring to is the effects of disenfranchised grief and social isolation due to unplanned childbirth interventions which contributed to an unexpected negative or traumatic childbirth experience. This article aims to unpack the concept of both of those terms, the consequences of such, and how we (mothers and community members) can attempt to address this problem. It is important to note that the event (what happened during the pregnancy, birth, and postpartum) and the individual perception of the event are both contributing factors that influence how well a mother integrates, makes sense out of, and resolves what happened during her childbirth experience. Two mothers could experience a similar unfolding of events and each of their perceptions of that experience will be different, which means that the impact of the experience will be stored differently within their nervous system and brain. How we perceive an event is influenced by many factors such as and not limited to: past events,family and childhood experiences, beliefs, current events, cultural and community beliefs, capacity for dual awareness, state of wellbeing, and overall mental health before the event occurred. Thus, the impact of a mother’s childbirth experience is unique with a dynamic interplay of both internal and external influences. All of which influence how she thinks, feels, and responds in the postpartum. Research suggests that the quicker a mother can process and integrate what has occurred the less likely she will present with symptoms of postpartum mood disorders (Edwards, Devries, & Hagan, 2014; Grekin & O’Hara, 2014). One of the ways mothers integrate highly charged emotional information is through expressed grief. Thus, it is imperative that a mother can process and integrate what happened during the continuum of her childbirth experience. Grief is a state experience that airs itself in response to a loss or death. It encompasses a multitude of emotions and includes non-linear stages of expression such as: denial, anger, shock, guilt, shame, sadness, confusion, and blame. Disenfranchised grief is a type of unacknowledged grief that occurs when culture, family, and community lack understanding and support towards the aired grief (Simington, 2013). In such conditions a mother feels alone and confused by her emotions when those who matter the most to her, and society at large, do not grant permission to grieve. Most likely, it is not that those around her do not support her grief, but rather they lack understanding or do not know how to offer support. Hence, the grief becomes internalized and supressed, and an internal negative dialogue takes over intensifying an already challenging situation. One can imagine that if a mother has unexpressed grief along with a negative mindset about herself and her birth experience, the likelihood of having difficulty in the postpartum increases, followed by a growing probability of being diagnosed with a postpartum mood disorder. What presents is unexpressed grief and internalized emotional and mental pain that was accumulated by the high degree of physiological stress throughout the childbirth continuum, resulting in no outlet to restore ‘self’ back to homeostasis (a balanced state of wellbeing). Mothers who had unplanned, unwanted, or unexpected medical interventions at any point throughout the continuum of childbirth can experience the following losses: loss of birth dream and vision; loss of physical health; disconnection to self; loss of financial stability; loss of career or vocation; loss of relationships; loss of spiritual connection; loss of mental faculty. One can imagine the energetic outpouring and attachment that occurs when a mother spends nine months or more imagining, dreaming, learning, anticipating, and planning for a certain kind of childbirth experience. To then be met with a completely different and unexpected occurrence than what was planned or envisioned. It is thusnormal to experience disappointment and grief when that expected event turns out to be a different reality than initially planned. Attached to a mother’s childbirth experience are all of the thoughts, feelings, smells, sensations, and images. The event is encoded with all of this information causing neurons to fire together, and thus wire together, cultivating what neuroscientist call ‘a neural networks’ of associated information (Dispenza, 2012; Siegel, 2001, 2010). If this information was processed as stressful, terrifying, disempowering, painful etc. then the memory will be stored as such. Within the continuum of childbirth, the stress response could be triggered due to the following: feeling out of control; lacking informed consent and choice; aggressive or unwanted physical exams; violating procedures; strangers as caregivers; intrusive sounds, lights, people; overwhelming pain; and terror of harm for baby and/or self. Distress, disappointment, and sadness are valid responses to such an experience. A mother who experienced something similar needs the space and encouragement to be allowed to cry, share, express anger and guilt, and come to terms with what happened. A distress. For many they experience shame in expressing their grief. There is a sense that ‘it is not okay to feel sad because my baby is healthy’. This sentiment furthers the gap of isolation. When a mother is negatively impacted by her childbirth experience, has unexpressed grief, and lacks support to process and integrate the event, her risk of being isolated in her emotions, thoughts, and sensations can escalate. Mothers cannot heal in isolation. As social beings, we heal in relationship to one another (Badenoch, 2008; Geller & Porges, 2014; Porges, 2009a). This lack of belonging comes as a surprise to many of the mothers I work with. Allow me to elaborate. Let’s look at the scenario of a mother who was planning to have a natural childbirth that resulted in an unplanned caesarean birth. Prior to her perceived negative childbirth experience this mother was a part of the natural childbirth community. Perhaps she joined a natural birthing class, attended a yoga or pregnancy movement class, joined online forums and blogs, talked with other mothers who gave birth naturally, and had a prenatal cohort. During pregnancy there was a sense of belonging; belonging to something meaningful and purposeful. However, the secondary loss of no longer belonging to a ‘community’ of mothers who can relate to one another has added another layer of grief to an already complicated situation. And in my experience, these mothers are sitting in silence with their grief, unsure how to integrate what has happened, and questioning where and if they belong to any group. To understand more clearly what I mean by different childbirth ‘groups’, I believe it is essential to distill what I call ‘the different camps of childbirth’. Natural vs Medical childbirth has been in opposition for years now; since the introduction to medical intervention and OBGYN’s. Rarely do these camps see eye to eye, although they have a growing tolerance forone other. Within the past 18 years, I can honestly say that there is still a strong us vs them mentality when it comes to the midwifery model of care vs medical model of care. For those who want to read more about this, Robbie Davis-Floyd, a Medical and Cultural Anthropologist, offers lots of insightful discourse on this topic. Fundamentally each model of care has differing points of view. This is not an article about which camp is better, but rather, let’s acknowledge that they are different. And what I am noticing surface is a third camp of mothers who perceive that they no longer belong to either camp. These are the silenced voices of mothers who aligned with the natural birthing community and had a childbirth experience that resulted in an unplanned and most often, unwanted, medically assisted birth. These mothers make up the majority of those who are coming forward to process their grief and trauma associated with their childbirth experience. Until recently, these mothers did not have a ‘term’ to describe what they are experiencing. They have been silenced due to internalized shame, confusion, disconnection, and externalized expectations. It is tolerated that camp A and B will have differing opinions, and often, when these mothers get together they choose to not discuss their differing perspectives and choices of childbirth. Many mothers feel supported within a community of mothers with likeminded parenting and birthing worldviews, and they rarely venture outside of this cohort. Thus, they are not isolated and they belong. However, mothers from camp C experience something different – they belong to neither camp A nor camp B. They are often afraid to speak about the event, especially if they are grateful for the medical support they received. Rarely do they have space to speak authentically about what happened and how they feel about it, nor do they feel safe to process their grief. I have heard mothers say that they refrain from sharing about their birth experience because they do not want to sound like they are complaining, or they are concerned about negatively impacting another mother’s perception of childbirth, and they sometimes internalize their grief as a sign of weakness. ​Although many mothers feel silenced or isolated in their experience there is an emerging voice that is beginning to surface, and the hope is that these mothers can offer encouragement and support to others. This group of sprouting mothers who are reaching out for support and courageously choosing to heal have an important role and influence within the childbirth community – they are bridging between two worldviews. Let’s take a closer look at this notion. What is a Bridge Person? Someone who can close the gap between one point of view and another point of view because they can offer insight and perspective based upon experience. This new role cultivates meaning and fosters a new sense of belonging amongst mothers and families. These brave voices will hopefully help to eliminate the us vs them mentality that overtly or subtly positions mothers against one another. We need more connection as mothers, and less shaming or shunning for childbirth choices. How to Become a Bridge Person? To begin, there is a need to own one’s story and begin to share it. Even if the story is unfinished and contains sadness, anger, frustration. This story is as important as every other birth story told. It offers a different perspective on birth - for some birth is hard, surprising, challenging, scary, confusing, disempowering, isolating, and unexpected. And, in all of that, there is still power, understanding, opportunity to heal, insight, transformation and an experience that has brought the mom to her edge. There is no right or wrong way to give birth; there are many ways to experience childbirth. And within that, there are many stories of birth. We need to hear all stories of birth, each unique tale, and engage with curiosity. Although this article was a brief introduction to a larger point of view and truly only skims the surface of a complicated and intimate journey into motherhood, it is my hope that as mothers and community members we begin to listen, truly listen, to each other with an open heart and mind. And thus, we begin to heal. Sometimes this is enough – to be fully received with open presence by other mothers and family members. To know that your experiences is as valid as everyone else’s. And, to understand that your process to sort out your childbirth experience is unique and important. When humans are truly received, we feel like we matter and thus, we belong. Belonging is one of our deepest innate drives. Thus, it is critical that we work towards inclusion so that mothers can rise strong. We need each other, bottom line. And, for some, belonging and being heard can help to shift unprocessed emotions about a negative childbirth experience towards deeper understanding and acceptance. Acceptance that as a mother you did nothing wrong, your body did not fail you, and that you did your absolute best at that time. Deeper yet, a shared knowing that you are all mothers on a journey. Badenoch, B. (2008). Being a Brain Wise Therapist: A Practical Guide To Interpersonal Neurobiology. New York, New York: W.W. Norton & Norton. Dispenza, J. (2012). Breaking the Habit of Being Yourself: How to Lose Your Mind and Create a New One. Carlsbad, California: Hay House Inc.
Edwards, S. R., Devries, L., & Hagan, A. R. (2014). Risk Factors for Postpartum PTSD : Coercion During Labor and History of Abuse, 10–11. Siegel, D. J. (2010). Mindsight: The New Science of Personal Transformation. New York: Random House Publishing Group. Simington, J. (2013). Trauma Recovery Certification Handbook (6th ed.). Edmonton: Taking Flight International. A woman who was mistreated during maternity care for her first pregnancy who went on advocate for respectful, informed maternity care and now researches birth experiences to better understand the challenges that exist in all stages of maternity care for both birthing people and care providers to better inform efforts to improve care. A woman whom experienced trauma and abuse in childbirth and after the experience of a healing birth despite lack of a supportive care provider now strives to challenge care providers to advocate for informed choice and focus on empowered woman-centred birth and evidence based care. A mother of two boys who experienced birth both in a medicalized setting and in the care of a midwife out of hospital, who changed careers based on the profound differences in her birth settings, and now supports pregnant women through pregnancy, birth and the postpartum period. A woman who had a fairly stereotypical experience with maternity care and hospital birth with her first child and, despite experiencing no trauma, felt that something was missing and went on to do research and pursue midwifery care and homebirth with her next three children. A well birth-educated woman who experienced an unnecessary cascade of interventions leading to an unnecessary and traumatic c-section due to rural, non-evidence-based practices in a health care system built on patriarchy and the expectation that women will do what they’re told to; who now suffers from unknown secondary infertility and has experienced five consecutive miscarriages. In 2013, maternity care consumers around Alberta grew increasingly concerned about the state of maternity care within the province. Specifically, there were issues with a deficit of maternity care providers (especially for low-risk pregnancies), access to care for rural and remote residents, as well as huge wait lists for midwifery care and areas of the province that simply had no access at all, to name just a couple of the major concerns at the time. In October of that year, representatives from consumer groups across Alberta, including some Albertans with decades of maternity care advocacy experience, met with representatives from the Alberta College of Midwives and the Alberta Association of Midwives to discuss the ongoing challenges with maternity care in Alberta, particularly with midwifery wait lists and lack of access to midwives in much of the province. 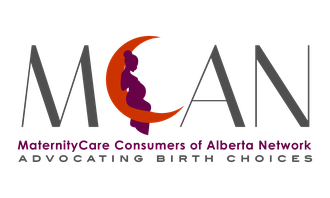 Out of that meeting, MCAN was revived to serve as an Alberta-wide maternity care consumer advocacy group that would work to ensure consumers had a voice, with the goal of speaking to ongoing issues with maternity health care and policy. MCAN's roots go back to 1986 and it had been dormant for sometime. The first major engagement of MCAN was to conduct a listening campaign to better understand consumers’ burning issues in maternity care across the province. The campaign involved an online survey with over 1,200 responses and 9 focus groups facilitated by long time maternity care champion, Dr. Lolly de Jonge. MCAN released the Listening Campaign Report in November of 2014 at a press release that was covered by major television and radio news stations. MCAN continues to share the consumer concerns revealed by the report to politicians, policy makers, as well as health care professionals and administrators. Since the release of the report, MCAN has been involved in important maternity care advocacy including representing consumers on numbers Alberta Health Services committees as patient representatives, providing comments for media stories on maternity care to better inform the public, facilitating information and education between Albertans, government, and maternity care consumers and working with other consumer organizations to advance work on diverse issues in maternity care. 1) Infant Feeding Support: To improve infant feeding support for families by lobbying for Alberta Health Services to adopt the Baby-Friendly Initiative and to fund human donor milk. 2) Maternal Mental Health: To improve mental health support in all aspects and stages of maternity care. The Maternal Mental Health Mandate Committee is kickstarting the MCAN blog. The current committee members have introduced their backgrounds with maternity care in the opening statements of this post. There were many ideas, issues and initiatives that fell under the umbrella of mental health including birth trauma, pregnancy and infant loss, post-partum depression and anxiety, and post-traumatic stress disorder to name a few. ● To create and develop space and modes for the identification of services, needs, and goals for Albertans to share and discuss their maternal mental health experiences and concerns (including infertility, pre-natal, birth, post-natal, and pregnancy and infant loss). ● To work with various organizations to develop methods for all Albertans to access maternal mental health resources and support, regardless of economic level or situation. ● To challenge the stigma surrounding maternal mental health issues, and show how the freedom to choose where, how, and with whom Albertans birth and feed their babies positively impacts maternal mental health. At this time the committee is made up of women with a wide array of maternity care experiences including infertility, pregnancy loss, post-partum mental health concerns, and birth trauma. With experience as mothers, mental health professionals, doulas, researchers, writers, and business owners. You can expect to see the Maternal Mental Health Mandate Committee carrying out work in numerous areas. Regular blog posts, vlogs, and podcasts from committee members, guests, and Albertans who wish to make submissions will help to share information with readers on topics related to maternal mental health. We will also continue to develop an online database of mental health resources for all areas of the province to better support individuals in understanding what services are available to them when they are in need. We will continue to pursue working relationships with other related organizations across the province. Finally, we will pursue awareness about maternal mental health matters to the public to help reduce the stigma that can be associated with mental health issues. We hope that mental health will continue to grow as a priority in maternity care and health care in general and will make efforts to pursue this aim. We wish to thank all of MCAN’s volunteers now and in the past who have worked to sustain the organization and its mission. Finally, we wish to especially thank those maternity care matriarchs who have spent decades investing their time to advocate for improved care for all Albertans. Look forward to more communication from MCAN’s Maternal Mental Health Mandate Committee! -The Committee Members, as listed below.